Temporary tattoos have become a popular trend today. They're fun, serve a short lived purpose and can come off in days to weeks. 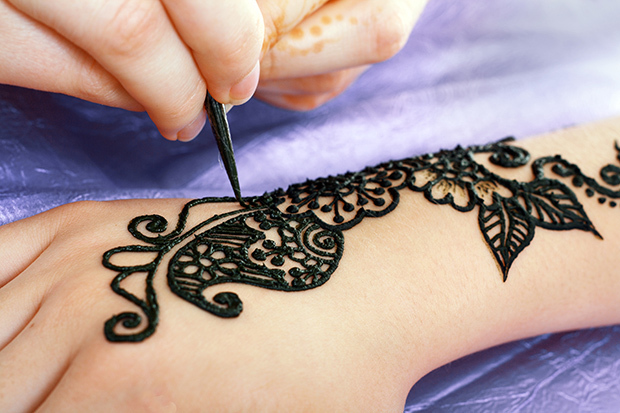 Temporary tattoos using black henna have become the focus of discussion for the latest consumer update by the FDA. These black henna tattoos have been linked to many reported problems such as blistering of skin, redness, raised weeping lesions, hypopigmentation and even permanent scarring. Lawsone is the active ingredient in henna creating the reddish orange stain.Henna comes from the Lawsonia inermis shrub. It can be found in products such as hair dyes as well as tattoo ink. People have used henna for centuries to dye their skin, hair, fingernails and even textile articles. Henna powder is the common form in which you’ll find marketed. Additionally of concern is the concentration of PPD in black henna inks. A study by Brancaccio and associates found PPD concentration at 15.7% in the black henna tattoo ink mixture a patient reacted to2. The concern here is this larger percentage of PPD will result in enhanced sensitization and any future exposure to PPD will bring on an allergic skin reaction3. Para-aminobenzoic acid (PABA) or 4-aminobenzoic acid is a compound found in folic acid, certain grain products, eggs, milk and meat. It is used to filter out UV rays in sunscreens as well as in sunscreen cosmetics. It is also used as a drug to treat certain skin conditions such as dermatomyositis, morphea and vitiligo. Other names for it include aminobenzoic acid, PABA and bacterial Vitamin H1. What this means is higher PPD concentration in black henna inks (just by getting a black henna tattoo) can sensitize you to PPD. The next time you are exposed to the PPD either by coloring your hair (PPD is in hair dye) or coming in contact with another chemical that cross reacts with it (for example PABA), you’ll develop an allergic skin reaction. Skin reactions caused from black henna use can result in scarring, keloids and permanent pigmentation changes. The growing concern over black henna tattoos and sensitization to PPD is due to the growing trend for black henna tattoos and also because coloring hair is popular in the United States and Canada. So the next time you see a tattoo stand or parlor advertising temporary black henna tattoos, take a few moments to think if this temporary tattoo will be worth it as you might find it more troublesome in the long run. If you experience a reaction to a temporary tattoo, the FDA recommends contacting your health care provider and the FDA’s problem reporting program, MedWatch. 2. Brancaccio RR, B. L. (2002). Identification and quantification of para-phenylenediamine in a temporary black henna tattoo. American Journal of Contact Dermatitis, 13(1):15-8. 3. DeKoven, F. R. (2007). Allergic contact dermatitis to paraphenylendiamine in hair dye after sensitization from black henna tattoos: a report of 6 cases. Canadian Medical Association Journal, 176(4): 445-446.